BEFORE: Some of the room's original foundation elements--such as the carpet, the wall color, and the painting--were perfectly suited to the space. The seating, however, was inadequate. AFTER: A large sofa and two stools maximize seating capacity in this living room while a new coffee table enhances function. The rug ties the room together. 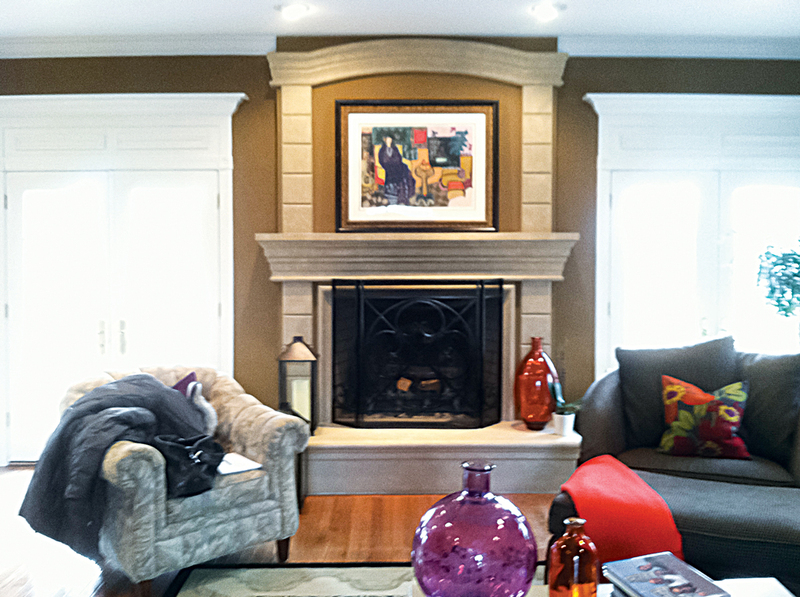 BEFORE: The room's original seating options were unsuited to the classic lines of the stone fireplace. AFTER: A recliner and a tall wing chair prove you can have symmetry without everything matching exactly. Where to start? “Clear the room of unnecessary clutter, keep the things you love and work off of that,” says Bevill, principal of Maria K. Bevill Interior Design in Chester. 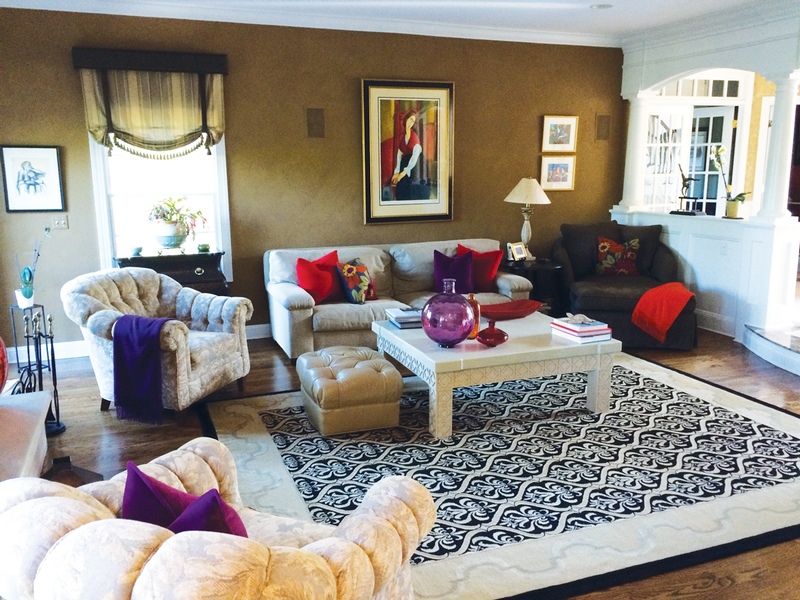 That’s the approach she and her clients took in this Basking Ridge living room. The clients craved a more fashion-forward aesthetic more in tune with their evolving tastes. “By changing up the window treatments, editing the accessories and adding some new furniture, we were able to take the room from dated to young and current,” Bevill says. DNJ: What did your clients decide to keep or clear out? BEVILL: The architectural elements remained in place. 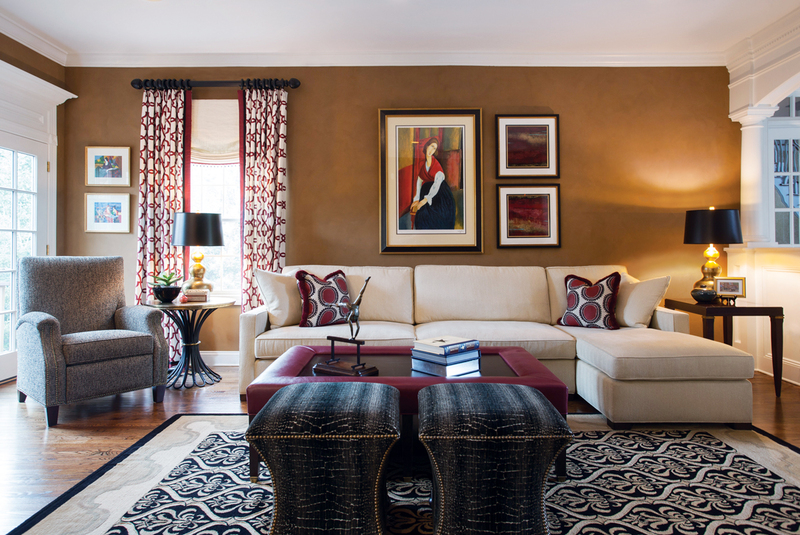 So did the wall color, a faux paint treatment in a mix of camels and soft browns. They also retained the rug, artwork and various accessories. DNJ: Did you ever consider reworking the floor plan or did the current layout work just fine? BEVILL: The room has a lot of length but not a lot of depth. The current layout made the most sense, where everyone has maximum exposure to the television. DNJ: How did they wish to improve the space, and what style were they after? 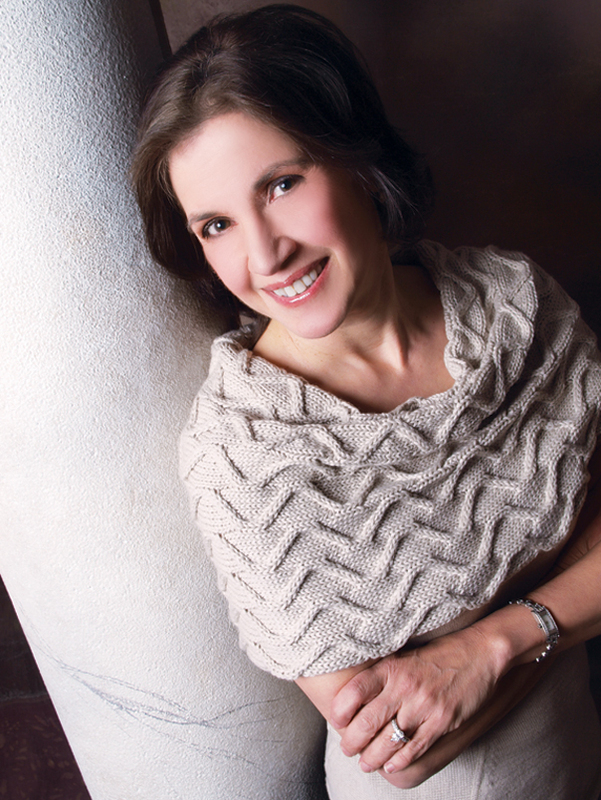 BEVILL: They wanted a younger, updated traditional look that was more tailored and less fussy with more laid-back textures and less pattern. They also wanted the setting to be more comfortable with a more user-friendly coffee table. DNJ: How did you use color to enliven the setting? 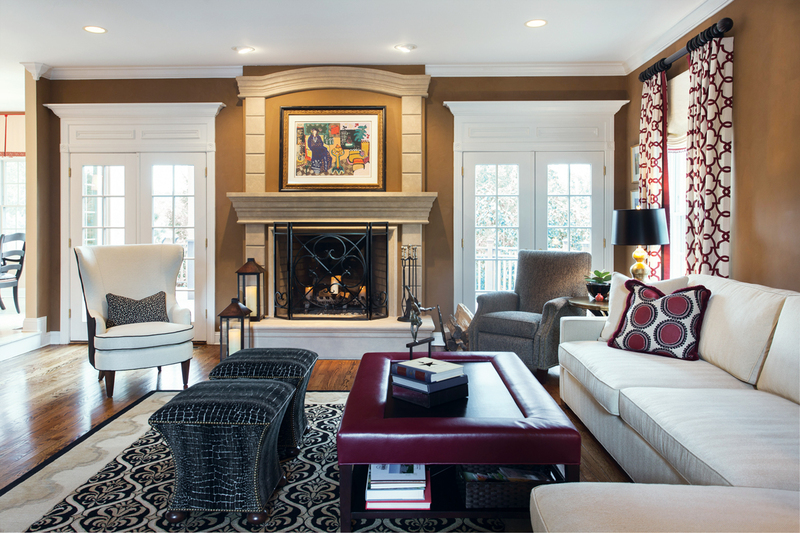 BEVILL: We used red, a natural color that is energizing, with the tones of the beautiful rug in black, off-white and beige. Colors come and go just like other trends in food and fashion. If you start with a neutral tone for your larger pieces like the sofa, you can add pops of color like red, aqua, orange or navy to keep the space current as color trends change. DNJ: Did they have a budget in mind? BEVILL: They wanted good-quality pieces, but we kept costs down by using fabrics that manufacturers offered as opposed to COM [customer’s own material]. DNJ: It looks like they replaced a matching set of patterned chairs and a bulky sofa among other items. What did you replace them with? BEVILL: A larger, more streamlined sofa in a linen-blend increased the seating capacity along with two versatile stools that can be moved wherever an extra seat or surface is needed. Matching club chairs were replaced with a comfy, stylish recliner and a tall wing chair that balances out the scale of the room. DNJ: The new end tables each have their own flair. Do you like to mix things up as opposed to having matching sets? BEVILL: You can have symmetry without everything matching. The scale or height should be the same or similar — as in the two end tables. I do like using matching lamps. Lamps are the jewelry in the room. You wouldn’t wear two different earrings. DNJ: Tell us about the new coffee table and the variety of textures you added. BEVILL: The new table is part ottoman done in a user-friendly faux leather so you can sit on it or put up your feet. The stools are covered in a faux croc fabric. DNJ: Describe the stylish window treatments. BEVILL: The tailored, non-fussy panels emphasize the ceiling height and add color without a lot of distracting pattern. DNJ: How would you describe the overall look? BEVILL: It’s eclectic and transitional in feel. DNJ: How did you approach the display of art? BEVILL: The existing art was rearranged and more transitional art was added to provide a more prominent display appropriate to the size of the wall. Adding something new to an existing piece of art or accessory—and putting it in a new place—will give it a totally new look. It’s like putting a new belt or scarf with an older dress. DNJ: We all know the transformative effect of a new accessory or how it feels to change things up. BEVILL: That is an old marketing concept that stores use all the time. They rearrange existing stock so people see it in a fresh way. DNJ: Any other tips for giving a space a new lease on life without starting from scratch? BEVILL: Again, start by cleaning out all the unnecessary clutter and accessories. Too many accessories — old silk plants, too many small items or too many photos — make a room feel dated. And take down overdone window treatments. Less is more!